Since 1977 PFERD & REITER offers holidays on horse back in about 50 countries of Europe, America, Asia, Africa and Australia, trails (one and two weeks), star rides, cross country, pack trips, instructions for beginners in western and English style, instructions in dressage-riding up to the highest level and instructions in jumping. 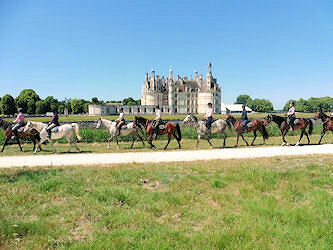 For beginners and advanced riders - accommodations of all standards (from "under the starry sky" up to luxury castles). Trails on the Atlantic beach or the charming hinterland of Portugal Delfin Trail 1.098,- Euro per person/week. All prices in double bed room without flights/transfers. Many destinations are English speaking. The catalogue of PFERD & REITER with 276 pages is published in German language only. Correspondence in English language is possible, but travel documents and information are in German language. On some pages, you can display the text in your language with Google translate. Legally binding is the original text in German.